This year Kareena has many reasons for celebrations. Having list of hits, at the end of the year she has been rewarded as Indian Diva 2006. This award is considered as one of the prestigious title in Bollywood. 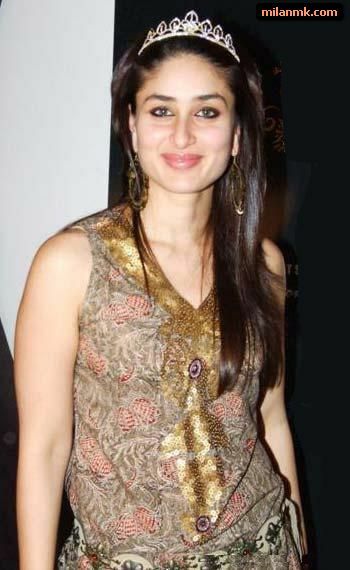 Sahara One Television viewers across the country voted for Kareena Kapoor. Eight electrifying Bollywood sirens, gunning for the title of Indian Diva 2006...that recognizes the most vivacious and gracious Bollywood star of the year based on the magic they create on the latest film tunes. India's first Diva Zeenat Aman crowned the three beauties Kareena Kapoor, Koena Mitra and Udita Goswami, who were radiating with charm and charisma. If there was ever a good time to become a couch potato, this is it! It is a rare event in which eight Bollywood sirens grace the television screen in one single start studded night. Special Performances in Hindi cinema is the latest avenue of ensuring popularity of movies amongst the Indian masses across the globe. Starlets have been born with one-off special performance, such that lead heroines are also taking on the mantle to perform to such popular tracks. Bringing the most vivacious divas from the film and television industry in performances featuring the hottest music tracks, the Indian Diva entertainment extravaganza is an absolute treat for Sahara One viewers. Well, Kareena you literally rock Bollywood this year. Hope you keep up the same next year!